Icebreaker 2 - 2011 Edition Released! It's here. I just couldn't wait any longer. You can download the game with covers here. And you can download the bonus DVD featuring Andy Looney here. I am hoping for an image of the original proto that I can work with but at the moment this is a reconstruction from the OlderGames release that was fixed up with files from the original Icebreakers game. Some very important files have been edited to hell and back and that was just not acceptable. Here is a preview of the single case cover, (there is also a double.) This is the same as the one I previously did minus the Looney Labs logo. Andy Looney wanted to keep the company in the clear. The double case version is for the bonus DVD that will be released sometime today. I will update the thread when it is up. Last edited by 3DO Experience on Sun Jun 10, 2012 11:58 pm, edited 5 times in total. 3DO Experience, you truly are ace at this. It's one of those moments where I wish my words had real meaning. But... your covers are ace. Outstanding! It's awesome that Andy allowed us to do this. Nice with the Bonus DVD too. Excellent! And I agree with the Kid, the covers you did look outstanding. Update! The bonus DVD is now available. 3DO Experience wrote: Update! The bonus DVD is now available. Hell Yeah man, you guys totally rock! Hey, just a quick one man, will these files print at the proper size or do I need to set up the measurements? They are set to 300dpi so they should print correctly with no problem. 3DO Experience wrote: They are set to 300dpi so they should print correctly with no problem. Of course, not on my computer. I do have a CD Cover printing program though and it did the trick. Awesomeness! Last edited by T2KFreeker on Wed Feb 23, 2011 2:07 am, edited 1 time in total. thanks ! I know what I'm doing today now . Let's hear it for 3DO Experience. And a cheer for this forum. This is great news - I was lucky enough to have Andy send me a copy a couple of years ago. Love or hate his games (I happen to love) he is a firm believer in the 3DO community. Is your copy the OG version or the unsigned version? NikeX wrote: Let's hear it for 3DO Experience. Damn It, I helped to get this released too! Thanks 3DO Exp!!! This will make a great first title to break in my "new" CRT TV... Finally the 3DO as it was meant to be! Last summer I came in contact with Andy and he was nice enough to sign my box copy of Icebreaker and send me Icebreaker 2. Awesome to see he supports the 3DO community! If I download Icebreaker2, how do I play it? Do I have to have FreeDo or do I burn it to a disc and put it in my 3DO? I've signed it. You can burn the game and play it in your 3DO. Yup, the DVD was a cool little addition. You should upload it already! Thanks for correcting this. This is an awesome game that anyone should check out, especially if they like freebies. The amount of freebies and 3DO fan-goodies in this forum is staggering! Thanks, and way to go! Anyone have any recommendations for putting some art on the disc to match? T2KFreeker wrote: Yup, the DVD was a cool little addition. You should upload it already! Click the second link at the top of the page. I see the art for the CD case (amazing work by the way) but I'm a total sucker for custom art on anything video game related. I want something that I can stick on the actual disc itself so I don't have just a plain burned disc in an awesome case. If its somewhere in that link and I missed it, im sorry. 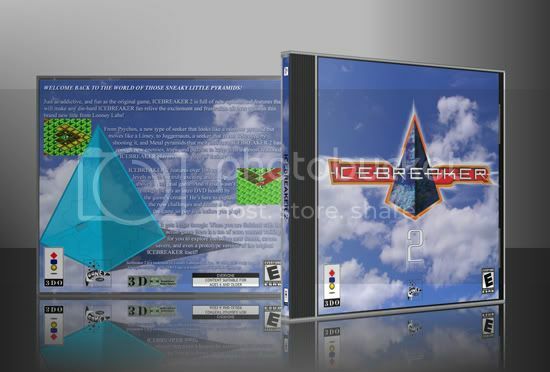 Re: Icebreaker 2 - 2011 Edition Released! I tried links for the Bonus DVD in posts 1 & 4 but neither seemed to be valid any more. Is there an alternate location where I might be able to score it? Thank you for this btw. I'm envious of those will the skill & knowledge to be able to release these to the community! Is there yt videos of this game? a31chris wrote: Is there yt videos of this game?